The Headline(s): Joe Gibbs Racing and Toyota took the horses out to the beach at Daytona and shot them between the eyes. 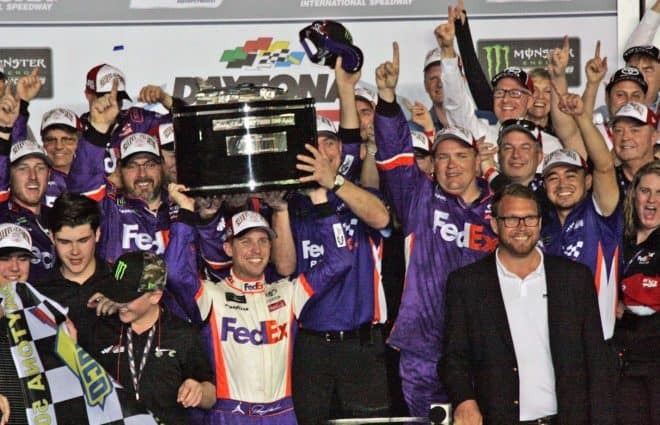 The organization swept the podium as Denny Hamlin scored his second career Daytona 500 victory. It was the first podium sweep of the Daytona 500 by any team since 1997. How it Happened, and Should You Care? Daytona ticket holders absolutely should because it has now been conclusively proven that an abysmal Clash and marginal Duel races will not prevent the Daytona 500 from being a race worth watching. Everyone who holds tickets for the Clash or the Duels, drop them and upgrade your 500 seats. For everyone else, the first 190 laps of this race exceeded expectations. Side-by-side racing did show up early and for most of stage one (won by Kyle Busch). Stage two may have gotten largely single file, but those 60 laps saw a stretch of plate racing affected by pit strategy in a way that was engrossing. A long stretch of racing that saw short-pitting Fords running separate from the lead pack of Toyotas became an intense pack race when the Fords, encumbered by a mix of lapped traffic, were caught by the lead Toyotas. The resulting 20-car or so pack was a battle not just for positions, but to stay on the lead lap, and it was mesmerizing from the grandstands. A lap 108 caution for a minor incident between Casey Mears and Parker Kligerman allowed for even more strategy, as the Team Penske Fords of Ryan Blaney and Brad Keselowski stayed out on old tires for stage points and capitalized (Blaney won stage two, Keselowski finished fourth). The final stage saw a restrictor plate race finally break out. After a strong run up front that saw pole sitter William Byron prove impossible to pass at the front, a mind-boggling wreck between Rick Ware Racing teammates BJ McLeod and Cody Ware shuffled the field. Stellar pit work and strategy put the Joe Gibbs Racing trio of Busch, Hamlin and Erik Jones up front. We tried to talk to Cody Ware after that pit road incident. (He's out of the race). The trio of Toyotas proved potent, holding the lead through wreck after wreck after wreck. The Mustangs that ran wild through Speedweeks before Sunday proved their own worst enemy, as Paul Menard, Ricky Stenhouse Jr. and Clint Bowyer caused three Big Ones in a row from lap 190 on. Through melee after melee, the JGR Toyotas of Hamlin and Busch proved too powerful to overcome, eventually holding off a disorganized charge by Ryan Preece and Joey Logano on the final overtime start. Daytona isn’t the start of the regular season, but there’s nothing wrong with opening a campaign with a 500 win. That’s what Hamlin did even with another new crew chief on the box. 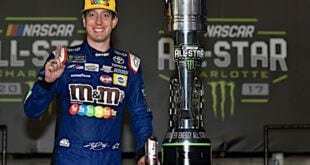 On Sunday, the Joe Gibbs Racing team capitalized on stellar pit performances and strategy that emphasized track position. Hamlin proved a steady, capable wheel at the front of the draft. He’s always been a rock star at Daytona, so it remains to be seen if the No. 11 team has turned a corner. But on this night, Hamlin looked every bit the star he did when he broke onto the Cup scene with a 2006 Clash win. Speaking of Toyotas, Matt DiBenedetto delivered a major league performance in his debut with Leavine Family Racing. He led a career-high 49 laps and proved stout enough in the second stage while leading the draft to lap cars at speed. DiBenedetto was one of the many victims of the lap 191 Big One, but his point was proven long before then. DiBenedetto has long been known for getting everything out of his equipment, and LFR is racing with a chip on their shoulder following comments from the team principal this week that said the difference between their previous manufacturer (Chevrolet) and Toyota is that Toyota actually helps. LFR having a driver that wants to be there as opposed to a faded star holding on is a move that will pay off. 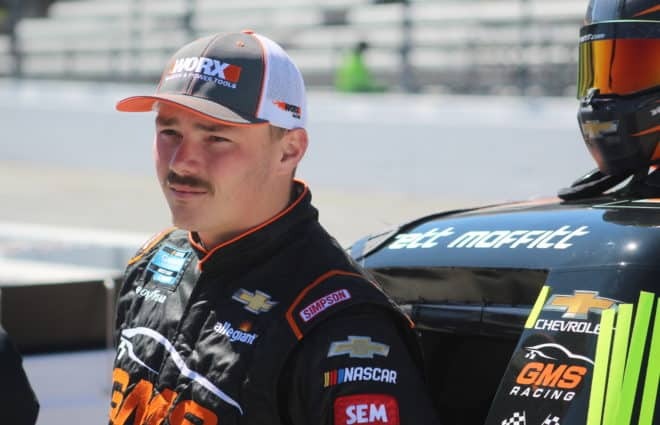 An even bigger offseason gamble over the winter came from JTG Daugherty Racing, who went old school to the short tracks in hiring modified standout Preece to replace AJ Allmendinger. 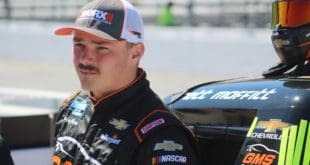 Preece was easily the luckiest driver in the field, miraculously ducking every Big One to score an eighth-place finish. “This one is for the grassroots guys,” said Preece in post-race remarks, hoping that his finish would translate into earned respect heading into his rookie campaign. Mission accomplished. Michael McDowell finished fifth, the first top-five result for Front Row Motorsports since Chris Buescher ran fifth in the 2016 Bristol night race. Ross Chastain (10th) scored his first career top-10 finish in a Cup car. Let’s stay on McDowell for a second. Fifth place is a tremendous finish for the FRM organization. Having said that, in post-race remarks, Busch and Logano, who finished second and fourth, respectively, were in unanimous agreement criticizing McDowell for his actions in the closing laps. Logano expressed frustration that McDowell opted to draft with Busch’s Toyota instead of Logano’s Ford, while Busch laughed at McDowell’s attempt to push him, making brake noises into the microphone. “Neither of us got the push” from him said Logano with a wide smile on his face. Fifth place scores points, but McDowell likely isn’t going to see any favors drafting based on this performance. Ware was the slowest car on track for all of Speedweeks, lost the draft on every restart, and then caused a major wreck on lap 160 when he spun his teammate McLeod into traffic as the team was preparing to make pit stops. The race wrecked both Rick Ware Racing cars. Ware refused comment to Frontstretch after the incident. None was needed. 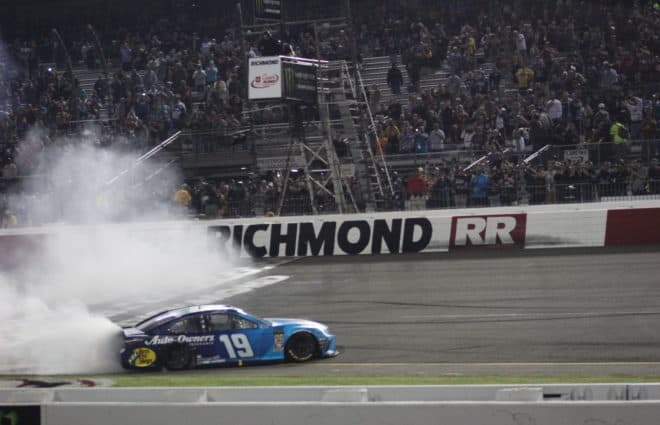 Tyler Reddick was just like his full-time Richard Childress Racing teammates on this day in that his race ended with the car mangled, but he also made several competitors unhappy out there. Darrell Wallace Jr. expressed frustration with him after their contact on lap 51, as did Preece (vocally) around lap 134 while running in traffic. Xfinity Series champion or not, Reddick did not make friends on the Cup side this Sunday. Every single driver not named Logano who piloted a Ford Mustang Sunday abjectly failed to, as Stenhouse put it on Thursday, “make sure a Ford wins.” Despite having cars that were by far the fastest of Speedweeks, the Ford teams found themselves outfoxed on pit road, unable to rely on teamwork when it mattered most (see McDowell) but most of all being their own worst enemies. Menard lost the moral high ground in his Clash battle with Jimmie Johnson when he triggered the first Big One on lap 191, dumping DiBenedetto (and collecting five Ford teammates). Stenhouse let 190-plus laps of composure (by his standard anyhow) go to waste when he went barreling into a hole that didn’t exist, causing the second Big One on lap 195 and taking himself and fellow Fords Kevin Harvick and Keselowski out of contention. Then Bowyer only five laps later sent the 500 into double overtime when he drove right across McDowell’s nose, wrecking himself and robbing Logano of the most potent potential Ford partner in the pack. Toyota certainly won the 500. Ford lost it. The grounds for revoking a charter on performance grounds requires an organization to finish in the bottom three of the owner standings for three consecutive years. That’s a gift for Rick Ware Racing if Sunday was any indication. That two cars as woefully off the pace as those of Ware and McLeod were locked into the Great American Race is problem enough (neither car could keep pace with the draft, even before being wrecked). But to see this team then wreck themselves when trying to pit, completely altering the direction of the 500, and to then listen to McLeod’s team sniping at each other as much as wrenching on their racecar to fix it was laughable. If NASCAR wants franchises, they’ve found their Washington Redskins with this bunch that can’t get out of their own way (and they weren’t even driving Fords). By causing the Big One one week after being taken out to start the Big One in the Clash, Menard gave the Daytona 500 a #metoo moment. Leave it to the oldest team in the garage to keep NASCAR socially relevant. Keselowski, prior to being swept up in at least three wrecks not of his making, was MIA from the front of the field, and part of that was just sheer dumb luck running into obstacles in the draft (more on that later). But to see Keselowski a literal non-factor outside of the last 10 laps of stage two on a plate track was striking when Logano was slicing and dicing at will throughout the field. Between dethroning the Big Three at Homestead last fall and proving to be the new Pied Piper now that Junior’s driving the pace truck, the 2019 season opener confirmed what many speculated after 2018: Logano is the top dog at Penske Racing. This is about as big a missed opportunity for Ford as one can find in motorsports. See above. If NASCAR is going to insist on making overtime part of its races, it’s time to put a hard and fast policy in place with regard to red flags. Sunday’s Daytona 500 was stopped twice in the final 13 laps for nearly 40 minutes to allow for track clean-up. They shouldn’t be faulted for that decision; the lap 192 red flag was in response to a big Big One, and given that Friday’s truck race saw five trucks in the first five laps either pit or wreck as a result of cut tires, opting to clean the surface up before the second overtime was prudent. 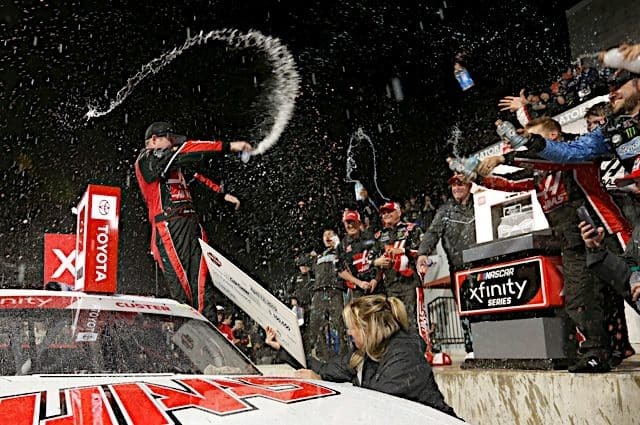 It does, however, differ completely from how NASCAR handled the previous restrictor plate race last fall, opting for a five-lap caution prior to overtime that saw Kevin Harvick run out of fuel while contending for the race win. NASCAR needs to set a defined lap marker where a red flag will or will not come out in setting up the field for overtime. Doing so would make dealing with overtime less of a lottery, and given what lottery racing has been shown to look like at Daytona this Speedweeks, that can only be good. Speaking to Coach Gibbs immediately after Hamlin, Busch and Jones finished 1-2-3 in the first Cup points race run since JD Gibbs’ passing, he seemed to suggest bigger things were at work in delivering such a stellar performance for the organization. Given that such a result came despite being the forgotten manufacturer for much of this Speedweeks and with some of the most volatile personalities in the garage racing each other clean for the biggest win of all, he may be on to something. In all seriousness, whether you’re a fan of JGR’s drivers or not, this organization deserved the win they got on Sunday, and from this writer, my sincerest congratulations. Best Paint Scheme: Ross Chastain There was absolutely nothing remarkable about the RoyalTeakCollection.com decals on Chastain’s black Chevrolet. But having said that, those decals gave us a fully sponsored Daytona 500 field, and that’s a beautiful thing. Special mention to the 1990s era Jeff Gordon rainbow Chevrolet in the infield that ended up being a fitting tribute to the departed Sam Bass. Bass, a legendary NASCAR artist, passed on Saturday at age 57 and will be sorely missed throughout the racing community. The Daytona 500 Front Row trophies: William Byron & Alex Bowman Notice how few times Hendrick Motorsports drivers were mentioned in the 2,000 words or so written to this point? Goes to show how much the 500 pole is worth. Don’t You Know Who I Am?! : More people know that Wallace finished second in last year’s Daytona 500 than know that Hillary Clinton came in second in the 2016 presidential election. 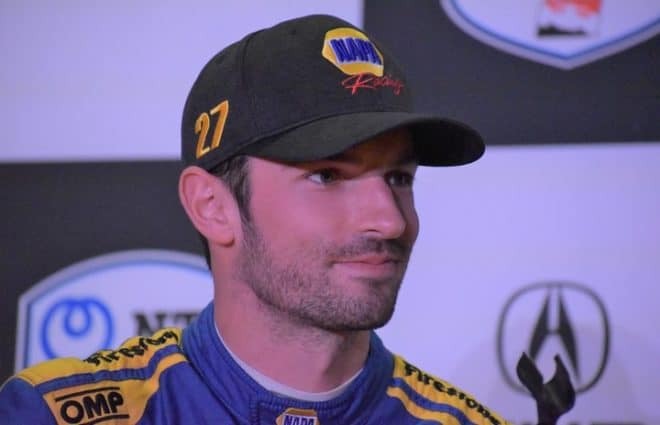 But when your Cup resume is as long as one runner-up finish and includes no shortage of incidents on track, throwing shade on an Xfinity Racing champion (Wallace quipped that “f**king Xfinity drivers think they’re ready for the big boys” after Reddick clipped rear-ended him avoiding the early race wreck between Kurt Busch and Stenhouse) is a little much. Especially considering that it wasn’t an hour later before race leader DiBenedetto was quoted saying “tell the No. 43 to open his eyes” when Wallace’s damaged machine didn’t immediately yield to the leaders. It Doesn’t Have an Off Button: Mike Herman Jr. Stenhouse’s spotter did a bang up job (for at least 190 laps anyhow), but his radio chatter makes Joey Meier sound like a mute in comparison. The “Peter Can’t Pick a Lane in Traffic” Red Swingline Stapler Trophy: A tie between Kyle Larson and Keselowski. Both drivers ran into more issues navigating the pack before the wrecks than the other 38 cars in the field. 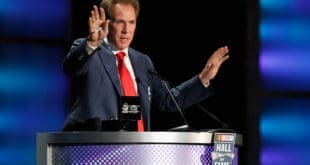 Ryan Newman Achievement Award: Jamie McMurray It was well known from both the Clash and the Duels that McMurray would be playing track position defense the entire 500, and McMurray obliged, proving impossible to pass all day long. 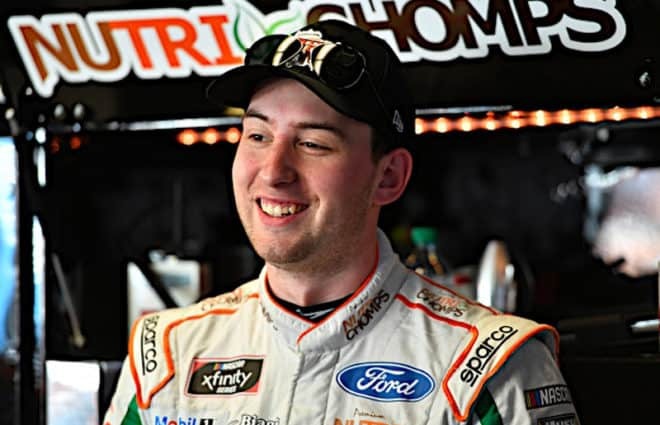 Kevin Lepage Achievement Award: Cody Ware Ware didn’t match the body count of Lepage’s 2008 boondoggle in the Xfinity Series race at Talladega, but spinning one’s teammate into oncoming traffic knowing pit stops were coming is on the same plane as merging into oncoming traffic after pit stops are complete. Fans finally got side-by-side racing, got to see excellent stretches of green flag racing punctuated by race strategy, and saw an upset in the sense that the Mustangs running wild were halted when the trophy was on the line. The ridiculous number of wrecks at the finish really spoiled this one, but we’ll give it a good, not great visit to the Deck Down Under. It was a meal worth eating, but frustrating that it took damn near four hours to get served. The regular season for the Cup Series kicks off Sunday at the Atlanta Motor Speedway. The Folds of Honor Quiktrip 500 goes green at 2:30 p.m. ET on FOX. Hey bubba, in 3 years you never won an Xfinity race. Let’s be honest, we all know why your driving in Cup. Are you seriously referring to Kasey Kahne that way? Wow. I don’t think he was referring to Kasey Kahne, who had already announced his retirement. Probably Ryan Newman, Jamie McMurray or AJ Allmendinger..
Kahne was driving for LFR last year. I call them bumper cars for a reason and the drivers treat them like it. Karma is when a driver reaps what he sows, even if he’s coming down pit road and his rear quarter-panel gets taken off by two bumbling, knuckle-headed drivers. Shout-out to Karma. I can’t say much negative about this race. My expectations were set so low by the Clash, Twins and Xfinity races that I was ecstatic that the race wasn’t a single file parade. I could have done without the huge crash at the end but **IT happens at Daytona and it always has. For anyone complaining would you have preferred a carbon copy of the Clash race? I agree with the Red Flag issue. NASCAR needs to standardize it. There should be some guiding rule like, if it’s going to take more than 10 laps to clean up then we will red flag the race (where the number of laps is based on track length and the number is communicated during the drivers’ meeting). Furthermore that rule should apply to the whole race, not just the end. Bill B – i was surprised that it wasn’t single file. they were saying warmer temps on sunday would keep them off the top. seemed like when it got dark and track cooled, everyone was up top again. my complaint, and always with plate racing is with the field clearing wrecks. i can see a rookie mistake, but last i checked menard and steinhouse weren’t rookies. how many times have we heard that you can’t bump draft the side of the rear ends, has to be square on. there was a point where i just wanted the race to end cause of the mayhem. as they say cautions breed cautions, and that is certainly what happened last evening. This report is better than watching the race. Don’t have to listen to the hyper-biased Gordon and the annoying Waldrip yammering on. Mike Joy is the only redeeming character of that crew. Reverend Joe sweeps the podium. Someone up there likes me. Take that haters. what a royal mess.. i can’t believe i was agreeing with dw to end this race. all that equipment that was torn up and went back to shop for scrap heap. i swear these drivers have a switch in their brains that turns off common sense and turns on stupidity with 20 left to go. i don’t know how roush tolerates steinhouse. i guess he wants us to remember how his ex drove while she was in cup. Stenhouse = money. That’s why Roush tolerates him. Please explain, I want to understand your reasoning. For the most part, other than RP tracks recently, he is a mid-pack driver with results to match. What do you know that I don’t with regards to him bringing in money. I actually thought the Fox announcers missed this one. There was a hole in the middle lane and a horrendous block was thrown by Larson who pinched him all the way to the inside line (into Harvick). They made that call based on his past reputation. I noticed that too. What would a certain announcer have said if it was a Hendrick car? Today’s drivers can’t finish a restrictor plate race without wrecking. “Go Time”’does not have to equal “run over your grandma for the win”. Except they weren’t wrecking Grandma for the win… they were wrecking her for 5th place! It took 1 hour and 27 minutes to run the last 20 laps. This is like the NBA. It’s 102-102 and two minutes left. Jump Ball. Let’s go! There’s 20 laps left. Boys, have at it! Demolition Derby at its most expensive. And lots of highlights for ads. They’re still showing 1979.